Rewind - The Russian Woodpecker. The Russian Woodpecker was a notorious Soviet signal that was heard on the shortwave radio bands worldwide between July 1976 and December 1989. It sounded like a sharp, repetitive tapping noise, at 10 Hz, giving rise to the "Woodpecker" name. The random frequency hops disrupted legitimate broadcast, amateur radio, and utility transmissions and resulted in thousands of complaints by many countries worldwide. The signal was long believed to be that of an over-the-horizon radar (OTH) system. 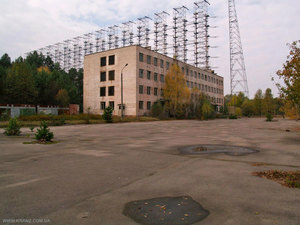 This theory was publicly confirmed after the fall of the Soviet Union, and is now known to be the Duga-3 system, part of the Soviet ABM early-warning network. Starting in 1976 a new and powerful radio signal was detected worldwide, and quickly dubbed the Woodpecker by radio amateurs. Transmission power on some woodpecker transmitters was estimated to be as high as 10 MW EIRP. As well as disrupting shortwave amateur radio and broadcasting it could sometimes be heard over telephone circuits due to the strength of the signals. This led to a thriving industry of "Woodpecker filters" and noise blankers. One idea radio amateurs had to combat this interference was to attempt to "jam" the signal by transmitting synchronized unmodulated continuous wave signals, at the same pulse rate as the offending signal. This idea was considered, but abandoned as impractical. Simple CW pulses didn't appear to have any effect. However, playing back recordings of the woodpecker transmissions sometimes caused the woodpecker transmissions to shift frequency leading to speculation that the receiving stations were able to differentiate between the "signature" waveform of the woodpecker transmissions and a simple pulsed carrier. Triangulation quickly revealed the signals to come from Ukraine. Confusion due to small differences in the reports being made from various military sources led to the site being alternatively located near Kiev, Minsk, Chernobyl, Gomel or Chernihiv. All of these reports were describing the same deployment, with the transmitter only a few kilometers southwest of Chernobyl (south of Minsk, northwest of Kiev) and the receiver about 50 km northwest of Chernobyl (just west of Chernihiv, south of Gomel). Unknown to most observers, NATO was well aware of the new radar installation, which they referred to as Steel Yard. Even from the earliest reports, it was suspected they were tests of an over-the-horizon radar and this remained the most popular theory during the cold war. Several other theories were floated as well, including everything from jamming western broadcasts to submarine communications. The broadcast jamming theory was debunked early on when a monitoring survey showed that Radio Moscow and other pro-Soviet stations were just as badly affected by woodpecker interference as Western stations. More speculative explanations were also offered, claiming it was a system for weather control or even an attempt at mass subconscious mind control. As more information about the signal became available, its purpose as a radar signal became increasingly obvious. In particular, its signal contained a clearly recognizable structure in each pulse, which was eventually identified as a 31-bit pseudo-random binary sequence, with a bit-width of 100 μs resulting in a 3.1 ms pulse. This sequence is usable for a 100 μs chirped pulse amplification system, giving a resolution of 15 km (10 mi) (the distance light travels in 50 μs). When a second Woodpecker appeared, this one located in eastern Russia but also pointed toward the US and covering blank spots in the first system's pattern, this conclusion became inescapable. In 1988, the Federal Communications Commission conducted a study on the Woodpecker signal. Data analysis showed an inter-pulse period of about 90 ms, a frequency range of 7 to 19 MHz, a bandwidth of 0.02 to 0.8 MHz, and typical transmission time of 7 minutes. Starting in the late 1980s, even as the FCC was publishing studies of the signal, the signals became less frequent, and in 1989 disappeared altogether. Today Google Map photography of the area shows that the antenna has been removed. 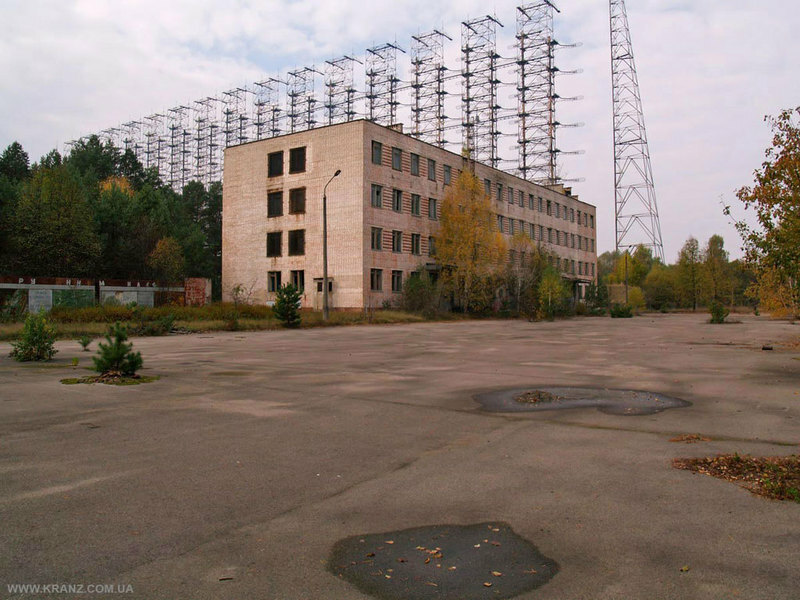 The original Duga-3 site lies within the 30 kilometer Zone of Alienation around the Chernobyl power plant. It appears to have been permanently deactivated, since their continued maintenance did not figure in the negotiations between Russia and Ukraine over the active early warning radars at Mukachevo and Sevastopol. The antenna still stands, however, and has been reported to have been used by amateurs as a transmission tower (using their own antennas) and has been extensively photographed. Thanks to John Alcorn VK2JWA for bringing this to out attention.